Hexus reports AMD slides reveal that the Trinity APU will be 29 percent faster than Llano in productivity applications, and up to 56 percent faster in terms of graphics. Interestingly, AMD will offer ultra-low-voltage editions of Trinity with a TDP of 17W, these chips are claimed to offer identical performance to current 35W Llano offers. Like-for-like, the new 'Piledriver'-based Trinity CPU is to be 29 per cent faster than its Llano counterparts, with the chip witnessing an even greater improvement in graphics performance, with a 56 per cent increase, all manufactured on TSMC's 32nm node, with figures originating from PCMark Vantage and 3DMark Vantage respectively. 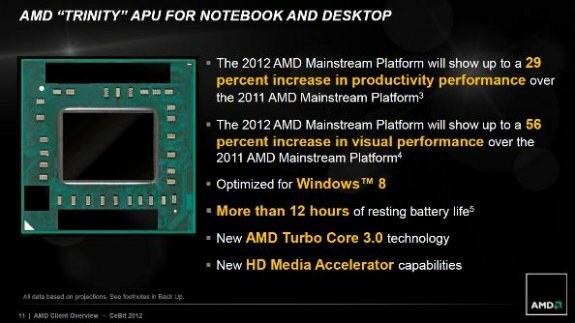 It has been suggested that Turbo Boost 3.0 could offer up to a 900MHz over-clock, bringing some APUs comfortably over the 4GHz mark. Whilst still based on the VLIW4 instruction-set from AMD's Radeon HD 6900-series of graphics cores, aside from a clear boost in core-count and/or clock speed, AMD has enhanced Trinty's graphics offering further with the inclusion of VCE, the video codec engine found in the new 7000-series of GPUs, AMD's answer to Intel's Quick Synch, enabling low-power hardware encoding of H.264, along with several enhancements to accelerated video playback.